La Portada Hospedaje is a small family run hotel in the heart of Tierradentro, Colombia. It is without a doubt the best location from which to explore the mysterious tombs and other sights that Tierradentro is famous for. You will find that the owners are friendly, knowledgeable, and helpful with any questions regarding the area’s attractions and transportation. Why Choose La Portada Hospedaje? La Portada Hospedaje is a charming base for exploring the area. The hotel is constructed in typical local manner with materials found in Tierradentro. 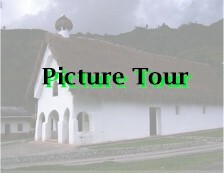 Guadua or giant bamboo was used for framing out the structure then the walls were cored with adobe or mud, and finally the walls were covered with spit bamboo or skimmed with a layer of concrete. This construction is incredibly strong, and because the guadua flexes the hotel can withstand the quakes that occasionally shake things up in Tierradentro and elsewhere in Colombia. The immaculate rooms have some of the thickest mattresses found in Colombia; it’s a great place to relax after a hard day exploring. La Portada Hospedaje’s bathrooms are modern with hot water; which is a rarity for hotels in Tierradentro. The restaurant for La Portada is directly across the street from the hotel and is open every day into the evening serving a variety of food and drinks to Tierradentro’s visitors. Additionally, each and every room in the hotel comes with a view of the mountains of Tierradentro. The location of the hotel in the village of San Andrés de Pisimbalá is in the heart of Tierradentro and it gives you something to do after dark. You can spend the evening in the hotel restaurant talking to other travelers or hang out at one of the stores chatting with the locals or just walk around the village watching local life.